William Trego’s portrait of his father, Jonathan K. Trego, is one of his few known surviving portraits and his most impressive. Like the small portrait Jonathan had painted of William in 1891, William’s larger work demonstrates the close personal and professional respect and affection the two artists had for each other. 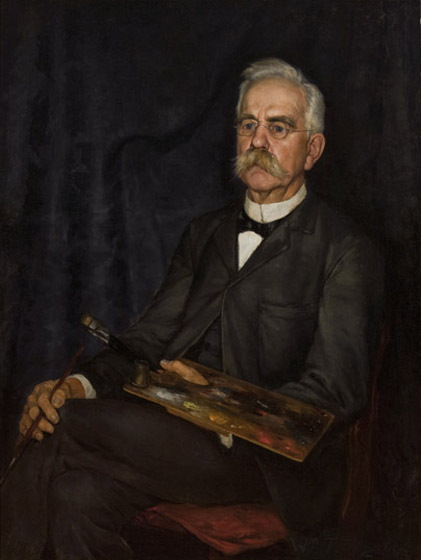 William portrayed his first teacher and mentor in the arts at work, holding his palette and brush, in their newly constructed studio in North Wales in 1893. Jonathan looks intently ahead as though analyzing the subject he is painting. In his dark suit, he almost blends into the even darker background. The painting can be seen in photos taken in the Trego studio in 1893 and in 1901. The artist gave it to his sister, Anna Louise Trego Dever in 1901. From Anna Louise it went to an unnamed cousin in 1940. It arrived at the Mercer Museum in 1975. Helen Hartman Gemmill, “The Artist with the Paralyzed Hands,” Antiques (November 1983), p. 997. The portrait arrived at the Mercer Museum in poor condition and received extensive conservation work in 1975 from conservator Joseph Amarotico of the Pennsylvania Academy of the Fine Arts. (Letter of Joseph Amarotico to Gary D. Shuman, Executive Director, BCHS, 20 October 1975, Mercer Museum files) The painting is now in excellent condition.